Jon Anderson, Steve Howe, Chris Squire, Alan White, and Billy Sherwood kept Yes albums ticking over after a few line up changes and it has to be said that they were able to keep the Yes sound well and truly refined, but the song writing and production suffered. The harmonies on this album are occasionally phenomenal and of course Anderson's vocals are always a delight to the ears. 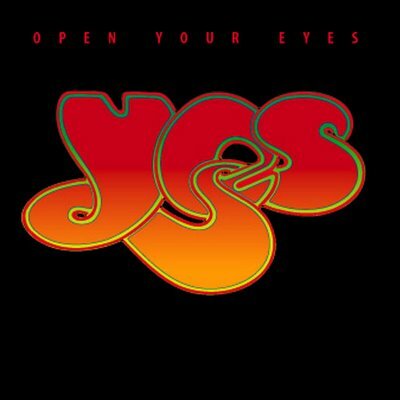 "Open Your Eyes" is certainly not a great Yes album in the catalogue though it has a very bright uptempo feel, only ruined by over production and some really woeful tracks. There is little of any prog on here but it has a few decent vibrant rock songs nevertheless. New State of Mind is a rocker that blows the cobwebs out of the speakers, with killer harmonies and welcome back Mr Howe. This is followed by OPen Your Eyes, a wonderful trtack with some vocals from Squire and Anderson trading off, you have to love that. This has an awesome bassline and some beautiful keyboard melodies. This is a definitive highlight on the album and indeed should have recognition in the 90s Yes catalogue as a highlight. No Way We Can Lose is very unlike anything Yes did in the past but its radio friendly sound will appeal to some. Its nice but forgettable to be honest. The positive sound generated makes one long for a nice dark Wakeman keyboard melody or a Topographic moment, but you'll get none here. Its accessible for sure but that keyboard solo by Igor Khoroshev is dreadful. And Chris Squire get off that harmonica please. Universal Garden has some spacey atmospheres, very good lead breaks and the vocals by Anderson are well executed. It may be the best track on this mediocre album. Fortune Seller takes a funk dive into the depths of over produced drivel. Its a slam dunk in the face of a progressive band that have simply lost their way here. The harmonies are grating on the nerves and its too glossy and bright with nothing much to recommend it in the way of a decent instrumental break or lyrics. Love Shine has an over produced bright crispy sound with too many harmonies. Its just saturated with saccharine sugar and sprinkled over with dollops of maple syrup. I had syrup dripping out of my speakers after this it is so saccharine. From The Balcony is a gentle approach and a very pretty tune that I have heard live somewhere. It is a shining light amidst a lot of dull tracks. Anderson is virtually solo and it works well. Somehow Someday is really annoying and frustrating as there are shades of the classic Yes style but is ruined by music that does not seem to fit. Billy Sherwood does nothing to augment the Yes sound, but this album is worth one listen to hear some of the experimental solo album styles of Squire and Howe. It does not sound like a Yes album because they had shed their old style and not many were impressed. It has to go down as one of the worst in the catalogue. Now I am off to wash my ears out with a dose of "Fragile".